After a busy week at a meeting in Michigan, Virgil Schmitt and I visited the Muscatine County farmer with Palmer amaranth to assess the population. This farmer first discovered Palmer amaranth in fall 2013 due to his vigilant awareness of a plant that did not seem to match the typical Iowa waterhemp. He has battled the issue using multiple tactics for the last two years: tillage, herbicides, hand-pulling, mowing of adjacent grass, and, importantly, removal of the infested area from crop production. Last spring, we checked on this population in May and found no shortage of seedlings in the area. This spring, we only discovered a handful of seedlings. It was actually quite difficult to differentiate the much heavier redroot or smooth pigweed population from the Palmer amaranth. We had to pull seedlings to check for hair on the plant stem. This seedling has ovate leaves and long petioles like Palmer amaranth but has a hairy stem. Palmer amaranth will be hairless. 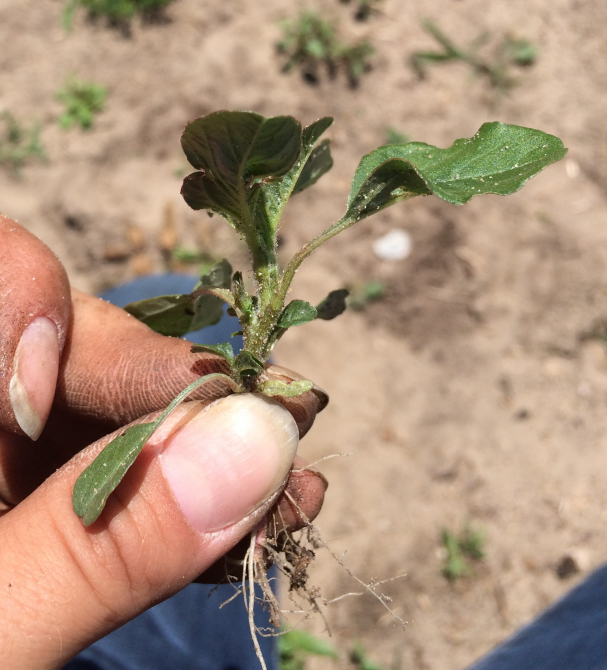 Palmer amaranth seedlings are particularly difficult to identify due to their similar appearance to waterhemp and other members of the Amaranth family like redroot pigweed and smooth pigweed. Redroot pigweed and smooth pigweed have pubescent (hairy) stems, making it very easy to tell these species from glabrous (hairless) species like waterhemp and Palmer amaranth. Notice the similar leaf shape and arrangement of these two plants. The plant on the right is Palmer amaranth, while the plant on the left is likely a smooth or redroot pigweed. Unfortunately, female inflorescences are necessary to truly differentiate Palmer amaranth from it's close relative waterhemp; this means continued vigilance in July and August will be important in discovering new populations. "Drive-by" scouting will not be enough to tell a Palmer amaranth population from waterhemp. If you get close enough to grab a female Palmer amaranth flower, the bracts surrounding flowers are sharp and will make identification quite easy. Notice the long, sharp bracts on the Palmer amaranth female flower compared to waterhemp. They hurt! 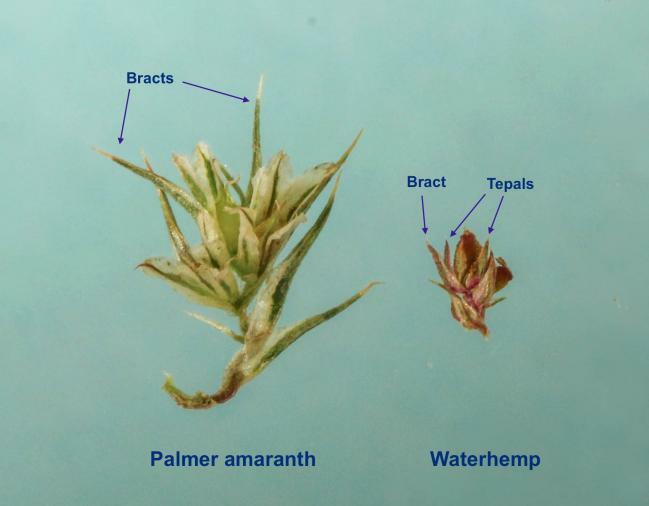 Iowa State University extension specialists have been following the Palmer amaranth populations since their first discovery in the state in August 2013. Please contact your local field agronomist if you have found a plant you suspect to be Palmer amaranth. Virgil Schmitt has been in his current position since 1992, although counties he's covered have changed over time.